This rudiment method is the reference by which all rudiments should be judged! 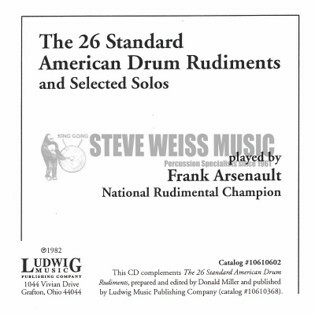 National Rudimental Champion Frank Arsenault burns through the 26 Standard American Drum Rudiments. Arsenault's recording has been used for decades as valuable teaching tool and point of reference for many students. Not In The Same Order. Be ware, these Rudiments are not in the same order on the CD, as when they were released on the original recording. I found a reference and Track List on Wikipedia.com, and was able to extract the files from the CD, and rename them so that they now play on my MP3 Player in their Origional Order. Other than this Minor Issue, the sound is spectacular. It was taken from a Record, so there is an occasional click and crackel, but it really doesn't interfere with the enjoyment of hearing these American Drum Rudiments. A must for all drummers. Listened to it when I was a teenager learning to play drums. Couldn't believe I found the CD. This is a must have for anyone interested in the history of rudimental drumming. It is wonderful that this recording is available on CD. I think this a very important recording to have, and to share with students who might not know much about the history of rudimental drumming in the US. Mr. Arsenault is very good!